While the weather outside may be frightful, it is time to take a look at the outside of your building and see what could make it delightful! Try to decide what needs to be done to be noticed by others. If your building fits in with all the other buildings on the block, you are doing something wrong. You do not want to blend in, you want to stand out and be seen. One of the fastest and easiest fixes for this is to add an awning. The awning will not only create depth with the look of your company, but it can also provide as a way to literally stand out. The awning typically stands away from the facade of your building, if someone is walking down the sidewalk on the same side of the street as your building they will not have to be standing in front of your business to see you are there you can see the awning. Hopefully you have great placement and they can see your name on the side of it. 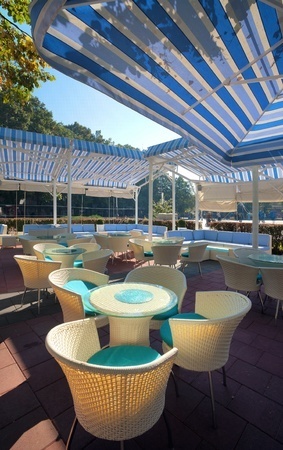 If you own a restaurant with available outdoor space you may want to think about adding outdoor seating with an awning. Nothing is worse than finding a spot to sit outside on a mild summer day but there being no shade. You cannot enjoy your meal while also feeling like the sun’s rays are melting you. Outdoor seating is comfortable in mild weather and even preferred during the summer months. This can also increase the amount of business you do during these months. If you create an extra 20 seats outside that is 20 more people dining and paying for you food on any day of the week. Awnings can be a great investment for any company especially when the timing is right. Get those awnings installed as soon as possible to make sure you are ready for the months ahead.